We feature pet panels and pet doors in various sizes and colors to match your sliding screen doors and hinged screen doors. We offer mobile installation, or pick up and delivery service. 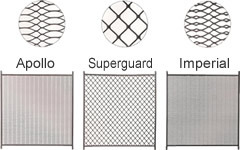 Extend the life of your sliding or hinged screen door with one of our three styles of pet guards.